Industrial ecology is an interdisciplinary systems approach that scientifically analyses flows of materials and energy, and its impacts on humans and our environments health. 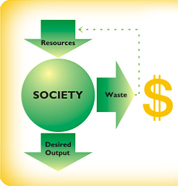 Such an approach highlights the true price of resources by taking environmental and social aspects into consideration including constraints on their availability, recyclability and the ability of our natural ecosystem to absorb disposed material and energy. “Industrial Ecology is very relevant and an urgently needed strategy for developing countries. As a matter of fact, inefficient use of resources and getting rid of wastes with end-of-pipe ‘pollution control’ technologies are truly unaffordable luxuries for developing countries!.” - Suren Erkman and Ramesh Ramaswamy. 2003. Applied Industrial Ecology: A New Platform for Planning Sustainable Societies: Focus on Developing Countries with Case Studies from India. Industrial Ecology can be relevant in a variety of fields- some of which are management of resources for manufacturing industries, agriculture, transportation systems, common resource management and planning for industrial estates and special economic zones. The Resource Optimization Initiative (ROI), a not-for-profit entity, has been set up to use concepts and tools of Industrial Ecology to promote strategies for sustainable management of critical resources in developing countries.